Tony Stewart and Sammy Swindell are two of the biggest names in 410 sprint car racing and this duo helped draw a standing-room only crowd to the Outlaw Speedway in Dundee on Friday night. The Ohio-based All-Star Sprint tour, which is owned by Stewart, was making it's initial appearance at the four-tenth mile Dundee oval. 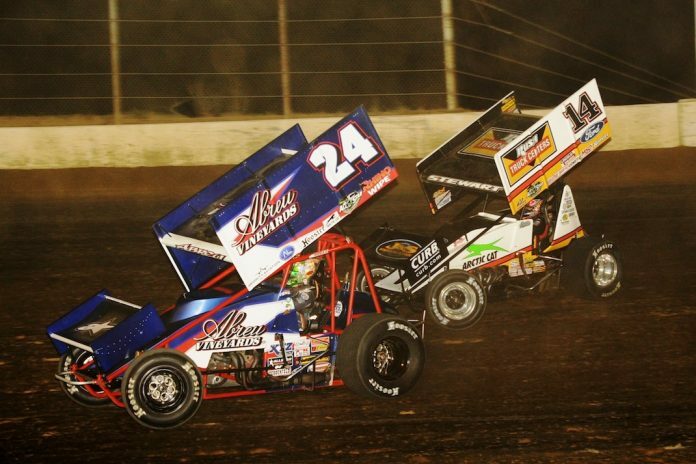 The show was very competitive and both Swindell and Stewart ran in the top five throughout their 30-lap main event. Ryan Smith ended up with the feature win and picked up $5,000. Series point leader Chad Kemenah was second. Swindell led in the early going before winding up third. Danny Dietrich was fourth with Tony Stewart fifth. 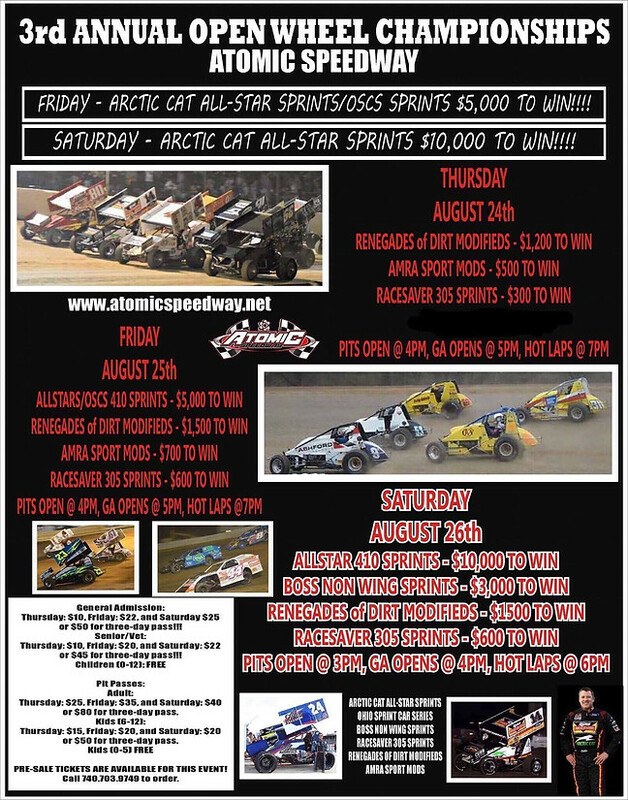 The All-Star sprints have a show at Orange County Saturday and Lebanon Valley Sunday. The big-block modified feature at Outlaw saw Matt Sheppard rack up his seventh main event win there in 2017. Alan Johnson and Steve Paine were second and third. Hmmm. Wonder what happened to Tony in the feature? Big weekend at Atomic Speedway. 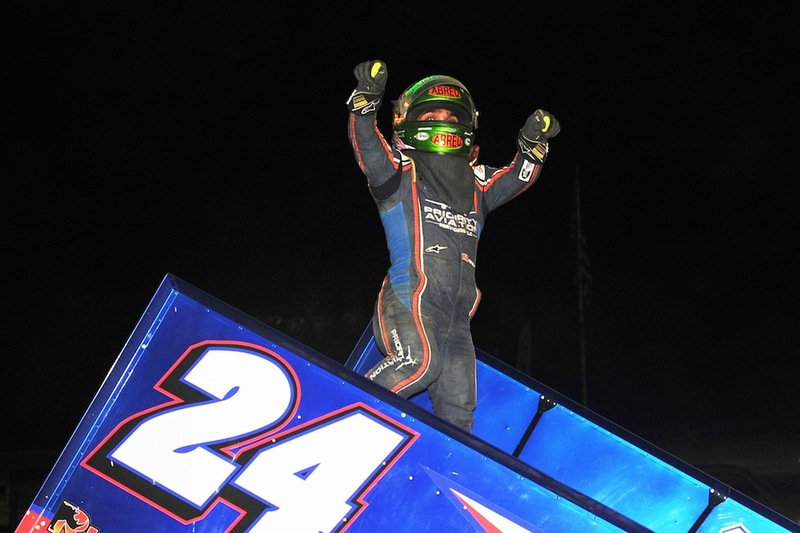 CHILLICOTHE, Ohio — Withstanding persistent pressure from his summer landlord, Tony Stewart, Rico Abreu earned his place in Arctic Cat All Star Circuit of Champions victory lane on Friday evening at Atomic Speedway, capturing the Open Wheel Championships preliminary victory worth $5,000 over a field of 46 entries. The Arctic Cat All Star triumph was the seventh of Abreu’s impressive career; his first at Atomic Speedway. On a surface narrowed by its abrasiveness, Abreu led all but one circuit of the 30-lap main event, swapping positions with Tony Stewart just after the pair reached traffic for the first time. Stewart worked by Abreu to officially lead lap 11, but after a side-by-side battle during the entire following circuit, it was Abreu who would lead lap 12. From that point forward, it was all Abreu at the front of the field, chased to the final checkers by Stewart, Cole Duncan, Lee Jacobs and Joey Saldana. Rico Abreu, Tony Stewart, Cole Duncan, Lee Jacobs, Joey Saldana, Max Stambaugh, Dave Blaney, Caleb Helms, John Garvin, Carson Macedo, Danny Smith, Spencer Bayston, Parker Price-Miller, Ryan Smith, Chad Kemenah, Brandon Spithaler, Bryan Nuckles, Logan Wagner, Jordan Mackison, Brent Matus, Tim Shaffer, Cale Thomas, Todd Kane, Ryan Myers.